Rated 2 out of 5 by CyndiLouWho2 from Love Mosaics But Not This One First, I liked the fact that there were many colors used in the mosaic puzzles. It made the final solution more colorful and realistic. HOWEVER, the problem was the background. Most of the time it blended in with the color of the grid blocks which made it difficult to see what you were doing and even more difficult to get a perfect score. Secondly, after filling in a row or column correctly, the unused blocks did NOT automatically fill in. I found this aggravating, distracting and a waste of time. Not having the option to disable the background was the final straw for me. The first straw was having to sit through the tutorial when I didn't need it. 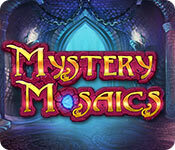 If you've never played this type of game, you may enjoy Mystery Mosaics. But for us seasoned players, I would not recommend it. Rated 2 out of 5 by smudge001 from Love these type of games but not this one Like the other person said the peach colored squares make it very difficult to know what you have and have not done. Rated 2 out of 5 by pennmom36 from Bah Humbug There are two types of mosaics available, pic-a-pix which is your typical mosaic puzzle where you fill in cells based upon the numbers located on each column and row, and fill-a-pix where you are given number values on the grid and you fill in the correct boxes based on logic. 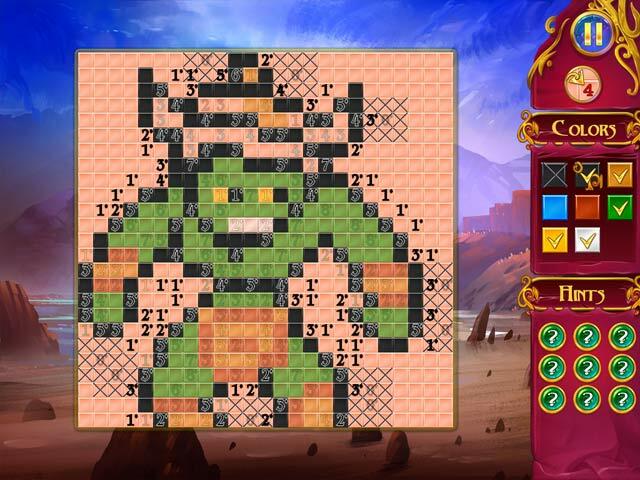 There is a story associated with each type and the mosaics do actually form a picture when completed (not on fill-a-pix) such as a tower, a shield, a magic wand and even the devil. What I disliked about this game was that the cells are peach colored and the colors that fill in the cells are very bland with pale shades that look very similar to the peach colored cells which at times make it extremely difficult to tell which cells have been filled. You don't get to choose a color one by one, they just fill in with several random and unappealing colors. I found myself making mistakes because of the pale color choices, therefore I just didn't get any enjoyment out of this game. Rated 2 out of 5 by wanttobigfish from Very Frustrating I usually love these games. This one was very frustrating. Usually when you have the correct number of blocks filled in the number will be crossed out. Not this one. I found myself recounting rows to many times. This factor might not have been so bad but when you right clicked on a block that block would just become a shadow of the picture in the background. The filled in blocks are different colors so now you have to much color going on and sometimes it would look like you had a block filled in when you didn't so if you didn't recount your blocks you could make a mistake. I like to play these to relax me. I think this could have been more enjoyable if they didn't have different color blocks and you couldn't see the background after you right clicked on it. Rated 2 out of 5 by LogieBaby from Only griddler addicts should like this one Mystery Mosaics fails on a lot of levels. For starters, the ability to avoid a tutorial is not given. Lots of players just don't need the lesson. Next we face a few 5 x 5 grids at the outset which again is only of benefit to rank amateurs. Once larger grids appear the delineation between filled squares and blanks is somewhat confusing. I was under the assumption that various colors are used, but saw nothing of the sort in the brief time I spent on the demo. 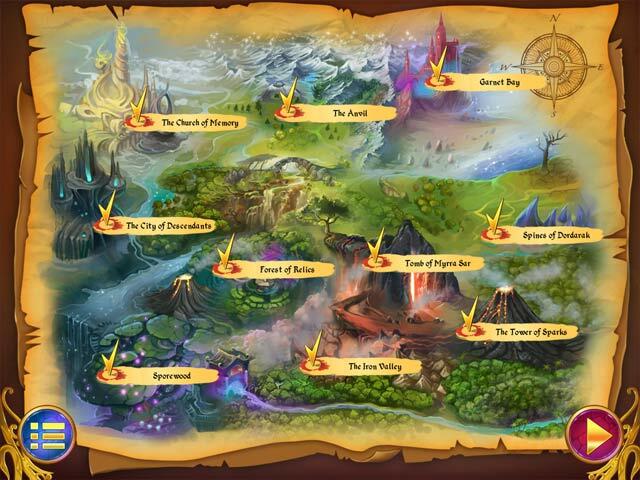 Lots of developers are producing second rate grid games. 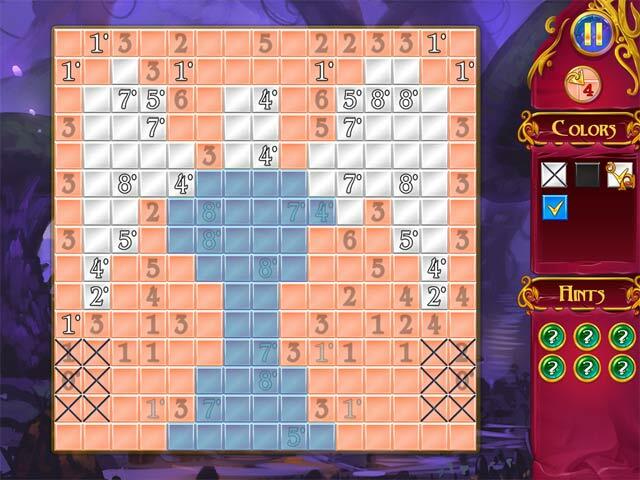 Those of us with experience are aware that Fantasy Mosaics produced by Match Gems are the absolute best on the market. Players new to the grid genre need look no further than the terrific tri-color FM series. Everything else is second best and often worse. Rated 1 out of 5 by Linca1 from Meeeh With other mosaic games out there, you should've upped your game. The game comes across as messy made, with colors that comes automaticly. 7 minutes of game = Not for me. Rated 1 out of 5 by amminnc from Sure to give you a headache! I love griddlers, nonograms, mosaics -- whatever you want to call them. However, this one is too confusing with various colors popping up, making it very difficult to readily see which squares are available and which ones you've already used. Gave me a headache after 10 minutes. UGH!